This week was a breath of fresh air! 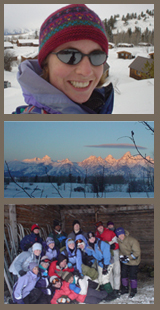 The 14 Principia Upper School students and two supervisors arrived at the Teton Science School on the 25th of January. I woke up at 6:00am most mornings and enjoyed the solitary blue light that comes before dawn. I like to sit in the dining lodge before the students arrive for breakfast and watch the sun come up to light the mountains. Next, Margaret Holt (the art instructor) and I (the writing instructor) would hold a two-hour nature journaling workshop. We helped the students with their drawing and creative writing skills. The students spent every afternoon out in the field with Robin and Elise, the TSS ski instructors, where they learned about local species and habitats. Evening programs included snow science, a talk about the lives of Mardy and Olaus Murie – a famous naturalist couple, and a folk guitar concert by Beth McIntosh. The students learned to work together as a group, to be more observant of their surroundings, and to be confident in their work. For some of them, drawing and writing in a nature journal was a new thing. For some, it was the physical activity of snowshoeing and crosscountry skiing that was new. Every student learned something outside his or her comfort zone. The other delightful thing about this group is that the seniors that came on this trip are the same kids for whom I wrote A Walk in the Rainforest in 1992. Only now they’re a lot taller. And some of them are becoming writers and artists themselves. On somewhat short notice, I was asked to be the writing instructor for a group of high school students visiting the Teton Science School in Jackson Hole, WY from St. Louis, MO. Principia Upper School has been running this art, science and writing trip for juniors and seniors since 1986, and I applied and got to go when I was in high school, in 1993 & 1994. So it was a real treat to get to come back as an instructor. As long as I was coming out to Jackson Hole, I thought I would see if any schools would be interested in an author vist. So I flew out a couple days early and spent this morning at Wilson Elementary, and the afternoon at Kelly School. Both schools were working on their own book projects in their classrooms, so they could relate very well to the talks I gave. The groups weren’t too big, so I got to answer most of their questions. They had some good suggestions for book topics too! I would love to write a journal book about the Tetons! Today I visited Prairie College Elementary School in Canton, OH. Several teachers stayed up late to pick me up from the airport when I flew in last night. They even took me out to dinner, which was wonderful. Today was “cozy up with a good book” day at Prairie College, so all the students came to school in their pajamas. One first grader asked me how I could draw things to look close up and far away. A great question from such a little reader! In the evening, I came back to the school to talk about books with the parents at family reading night. It warms my heart to see so many parents willing to support their kids’ interest in books. Thank you Prairie College School!